The Volkswagen Passat TDI clean diesel just set a world record by achieving 77.99 mpg – the lowest fuel consumption for a non-hybrid car. 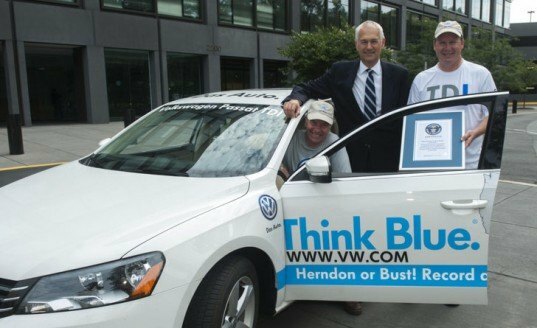 VW announced that the new Guinness World Record was achieved by drivers Wayne Gerdes and Bob Winger, who piloted the diesel Passat around the lower 48 U.S. states. The achievement also beats the hybrid vehicle record of 64.6 mpg by more than 13 mpg. Gerdes and Winger left VW’s headquarters in Herndon, Virginia on Friday, June 7th, at 12:00 pm and arrived back on June 24th, having covered 8122 miles and visited all 48 states. Wayne Gerdes, founder of cleanmpg.com was the primary driver. Automotive journalist Gerdes has made a career out of hypermiling and has set mileage records in more than 100 vehicles, as well as achieving the record for lowest fuel consumption in the lower 48 U.S. states with a hybrid vehicle at 64.6 mpg. How did the two drivers achieve 77.99 mpg? Gerdes and Winger obviously used some specialized techniques, that would be beyond the scope of the average driver, like hypermiling. But they do suggest that simple techniques like obeying speed limits, accelerating slowly from a stop and trying to not brake to hard will increase a vehicle’s MPG. The Volkswagen Passat TDI clean diesel just set a world record by achieving 77.99 mpg - the lowest fuel consumption for a non-hybrid car. 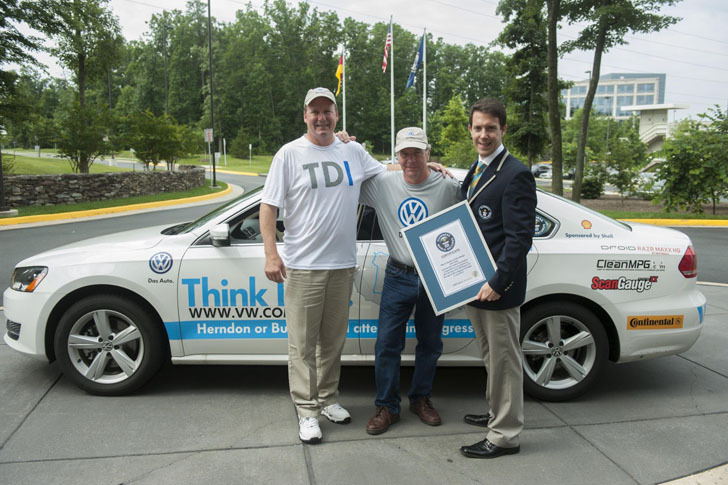 VW announced that the new Guinness World Record was achieved by drivers Wayne Gerdes and Bob Winger, who piloted the diesel Passat around the lower 48 U.S. states. The achievement also beats the hybrid vehicle record of 64.6 mpg by more than 13 mpg.